Divinity: Original Sin might be the most RPG-ish name ever committed to a game. It's an almost dangerously generic fantasy title, to the point that, if the developers ever release an expansion called "Awakening", we may hit Bland Armageddon. Hellish administrators will swarm the Earth, enslaving humanity with obtuse paperwork and Toploader CDs. Hopefully they won't do that, because otherwise, their game would appear to be quite good - as evidenced by both Craig's Early Access report and this new trailer. 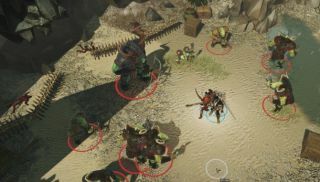 "The world is growing ever more vast and more interactive," explains the trailer's description, "and here you'll find a first look at some of Rivellon's previously unseen fairytale landscapes and creatures. If you pay close attention, you'll find that it's not only your elemental powers, but also tempestuous weather that can shift the winds in combat." As the trailer reveals, Divinity: Original Sin will be released this Spring.